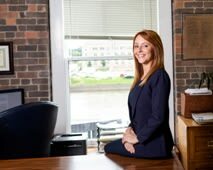 Attorney Sarah Wolfe is an associate attorney with Hedberg & Boulton, P.C. She earned her law degree from Drake Law School in December 2013 and was admitted to the Iowa bar in February 2014. She is a 2007 graduate of Muskego High School in Muskego, Wisconsin. Sarah practices in the areas of workers’ compensation, personal injury, civil rights, and estate planning.